Less than half a mile from Jim’s home on Beechwood Road in University Park, MD sits Northwestern High School. Walking to the corner and turning right, or riding his bicycle, Jim would have been in the front door of what was then a brand new school in just a matter of minutes. He made good friends there and began his exploration of the visual and performing arts. 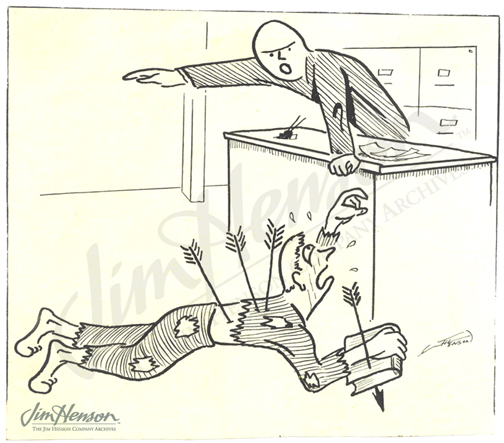 From the fall of 1951 until June 1954, Jim made the most of the creative opportunities at NWHS, providing covers, cartoons, and spot illustrations for student publications like Wildcat Scratches and Midget Mag. His talent for set design was showcased in school theater productions and the puppet shows of Les Petit Players, and he took on an occasional dramatic role. Cornering the ecclesiastical parts, he played Father Daly in The Valiant and the Rev. Dr. Harper in Arsenic and Old Lace. 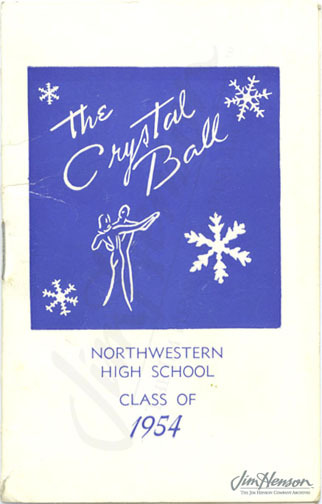 He served on the decorating committee for student dances, designing the cover of the dance cards for “The Crystal Ball” his senior year. Jim rounded out his activities as a member of the tennis team and was recognized for academic successes with a membership in the National Honor Society and the Quill and Scroll, the international journalism honor society. Like Jim, the students at Northwestern High School continue to be vibrant and engaged. In 1998, construction began on new school buildings on the same campus to replace the one from Jim’s school days and opened to students in 2000. Only the auditorium, where Jim spent many hours, remains from the old structure. Jim’s spirit, however, continues to inspire students there. Of the several sub-schools at NWHS, the largest specializes in the arts and houses academies focusing on visual arts, vocal and instrumental music, and the humanities. In 2002, it was dedicated as The Jim Henson School of Arts, Media and Communications. Through the efforts of the school administration and teachers along with The Jim Henson Legacy and Jane Henson, students there learn about their school’s connection to its namesake and are given opportunities to participate in Henson-related activities with the Smithsonian Institution, the University of Maryland, and other area organizations. As the second largest fine arts program in the country incorporating music, dance, and drama, the naming of The Jim Henson School at NWHS is a thoughtful and appropriate tribute to their most famous graduate. 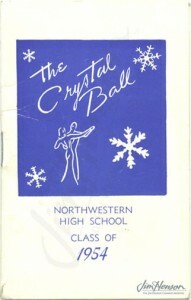 Jim’s cover design for a high school dance card, 1954. Jim’s cartoon from a Northwestern High School publication, early 1950s. 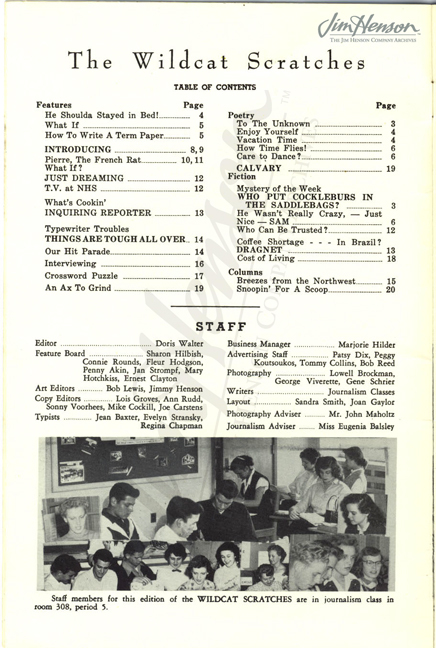 The masthead from NWHS’s Wildcat Scratches. “Jimmy” Henson is in the picture at the top, third from left. 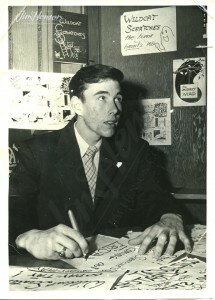 Jim promoting NWHS’s Wildcat Scratches, 1953-54. 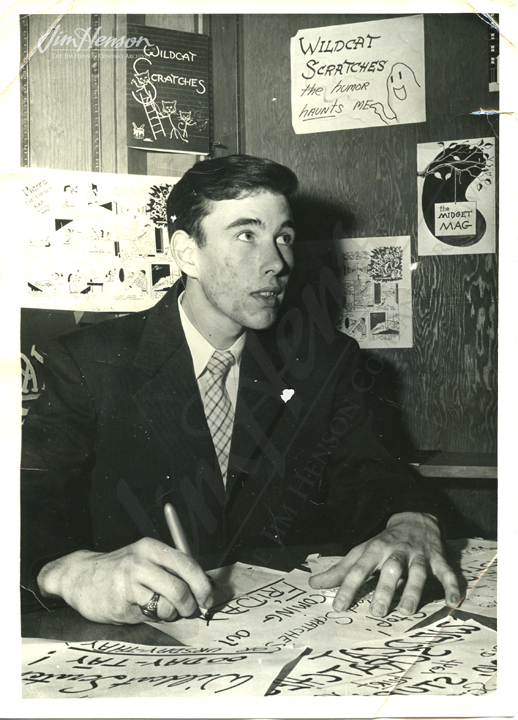 This entry was posted in 06-June '54, 1954 and tagged Arsenic and Old Lace, Jane Henson, Jim Henson Legacy, Maryland, National Honor Society, Northwestern High School, Quill and Scroll, The Valiant, University Park. Bookmark the permalink.